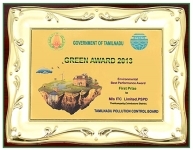 The Kovai Unit of ITC’s Paperboards & Specialty Papers Division has received First Prize in ‘Green Awards 2013’ instituted by Tamil Nadu Government for promoting green initiatives and environmental best practices. The award has been instituted jointly by Ministry of Environment, Government of Tamil Nadu and the Tamil Nadu Pollution Control Board in 2012 to recognise green initiatives undertaken by industries across the state. The Kovai unit was selected among 400 participants.